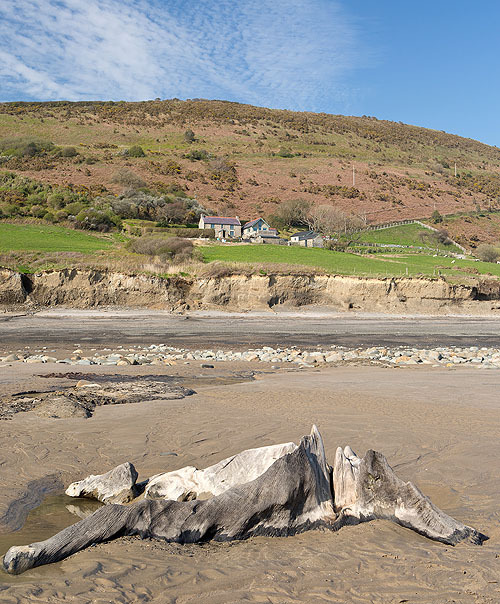 As at AMROTH (Pembrokeshire) - Marros Sands (Carmarthenshire) , has the remains of a forest drowned by rising sea levels about 6,000 years ago , fallen trees , tree trunks , roots.... in peat deposits. The 2014 storms have scoured the beach revealing more of the Submerged Prehistoric Forest than is usual. The deposits are in an area up to 100m wide and 2,000m long to the west of Ragwen Point . Colonies of Common Piddock have bored into some of the deposits. This photo is of a Tree Stump with Underhill Farmstead in the distance.